The Texas Chapter of the American Fisheries Society (AFS) awarded Justin Hansen, a University of Houston-Clear Lake graduate student and EIH graduate research assistant, the Student Scholarship Award at the 2019 Southern Division AFS meeting in Galveston, Texas. Harvey did a number on the hobos and the troll. These are the names of the digital devices University of Houston-Clear Lake’s Environmental Institute of Houston uses to test for water for temperature, salinity, and dissolved oxygen (called a Hobo) and water depth (called a Troll). On Friday, April 27, 2018, Anna Vallery successfully defended her MS thesis entitled "Assessment of shorebirds and wading birds in Galveston Bay using conventional and UAV techniques." For as long as he can remember, Jack Gandie has fished the part of Lavaca Bay closest to Alcoa. The Gulf Research Program (GRP) of the National Academies of Sciences, Engineering, and Medicine today announced 11 grant awards totaling $341,283 to assist in the recovery of Gulf Coast scientific research efforts impacted by hurricanes Harvey and Irma. There are 16,000 miles of waterways within the Houston-Galveston region of Texas, USA. These waterways provide an estimated 80% of the region's drinking water, however more than 80% of monitored waterways don't meet state water quality standards. The Galveston Bay Dolphin Research and Conservation Program (GDRCP) is ramping up its dolphin surveys with the help of rapid response funding from Texas Sea Grant, through the Gulf of Mexico Alliance (GOMA). Vanessa Mintzer of the Galveston Bay Foundation and Kristi Fazioli from the Environmental Institute of Houston (at the University of Houston-Clear Lake) are studying dolphins in upper Galveston Bay. Much debris has been cleared out, but three months after Harvey’s landfall, the ecological damage is still being assessed. Kristi Fazioli first spotted the pair of dolphins swimming behind a shrimp trawler near Morgan's Point, eager to get a mouthful of breakfast. In response to a petition filed by the Center for Biological Diversity and several Texas-based conservation organizations, the Texas Parks and Wildlife Department on Tuesday agreed to propose a rule ending unlimited commercial trapping of the state’s wild turtles. 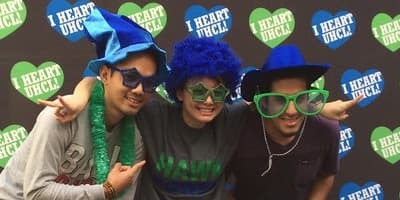 UHCL's College of Science and Engineering - Learn about the college and the different institutes that make the college of science and engineering at University of Houston-Clear Lake. The Environmental Institute of Houston, along with the UHCL Fire Marshal, the Texas Parks and Wildlife Department and the Galveston Bay Area Master Naturalist, performed a prescribed burn on Thursday, February 9, at the EIH demonstration prairie site. The Environmental Institute of Houston is deeply saddened to hear of the passing of Terry Hershey on Thursday, January 19, 2017. UHCL graduate student Nicole Morris was walking transects, or straight lines, in the marshes of the Sweetwater Preserve on Galveston Island when she made a surprising discovery. On Tuesday, August 23, 2016, Nicole Morris successfully defended her MS thesis entitled "Mercury Monitoring in Texas Estuaries." University of Houston-Clear Lake has a new perspective on local habitats and wildlife with the addition of some high-flying equipment. Kristi Fazioli slowed the Boston Whaler and cut the engine when a fin finally emerged where the Houston Ship Channel passes Bolivar Peninsula. At the bow, Sherah Loe, a graduate student, readied her camera. Josi Robertson, EIH graduate research assistant and student in the Environmental Science M.S. program at UHCL, was awarded the 2016 Outstanding Graduate Student in Environmental Science Award on Thursday, April 14, 2016. After a successful application round, the EIH and the QuestUAV AQUA drone have been awarded FAA approval to fly missions within the United States for research and mapping. LyondellBasell, one of the world's premier plastics, chemicals and refining companies, has contributed $6,000 to the University of Houston-Clear Lake Environmental Institute of Houston's new community and teacher rain barrel program. NASA Johnson Space Center's internationally acclaimed scientist Kamlesh Lulla received one of the highest NASA honors—the NASA Exceptional Service Medal—for his long and outstanding contributions toward developing technology collaborations for future exploration missions. LyondellBasell, one of the world's premier plastics, chemicals and refining companies, has contributed $10,000 to the University of Houston-Clear Lake's Environmental Institute of Houston for its environmental education programs. The University of Houston-Clear Lake's Environmental Institute of Houston has received a $3000 Horned Lizard License Plate grant from Texas Parks and Wildlife Department's Texas Wildlife Diversity Program to increase wildlife viewing opportunities on the UH-Clear Lake campus. The Environmental Institute of Houston partnered with the UHCL Art and Design department to create a wrap for EIH's cargo trailer. University of Houston-Clear Lake Associate Professor of Biology and Environmental Science George Guillen has been awarded $204,300 from the Texas Commission on Environmental Quality and the Environmental Protection Agency to study the water quality of the rivers and streams in Texas. Three Environmental Institute of Houston-sponsored graduate students presented their research findings at the 117th Annual Meeting of the Texas Academy of Science which took place from March 7–9, 2014, at Texas A&M University at Galveston. The weekend of September 13-15, 2013, the Environmental Institute of Houston's Senior Research Associate Mandi Moss and graduate student Michael Lane joined Texas A&M University at Galveston sea turtle biologist Tasha Metz in Matagorda, Texas, on a sea turtle entanglement netting trip coordinated by TAMUG. Environmental Institute of Houston-sponsored graduate students Rachel George and Bryan Alleman attended and presented their research findings in a poster paper, Possible Effects of Salinity on Texas Diamondback Terrapin, at the 6th Symposium on Status, Ecology and Conservation of Diamondback Terrapin, which was held at St. Christopher's Camp and Conference Center, Seabrook Island, S.C., on September 13-15, 2013. 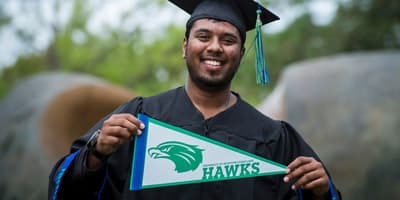 UHCL is recognized by the Environmental Institute of Houston for having an environmentally friendly campus and protecting the nature and wildlife inhabiting it. The Environmental Institute of Houston's E-shock crew and boat won third prize in the sponsored power boat 27 ft and under category at the 51st Clear Lake Boat Lane Parade. Sheila Grigsby Brown, habitat curriculum specialist with the Environmental Institute of Houston, delivers $1000 worth of curriculum materials to Durkee Elementary (HISD). Former EIH student worker and UHCL graduate student in environmental management has been named finalist for prestigious 2013 Dean John A. Knauss Marine Policy Fellowship. The University of Houston-Clear Lake was represented by EIH, as staff and students participated in the local Clear Lake community celebration marking the gold anniversary of the Clear Lake Boat Lane Parade. Houston and Bay Area teachers were honored for their outstanding dedication to science and mathematics education by the University of Houston-Clear Lake School of Education/Environmental Institute of Houston and the Texas Regional Collaboratives at the annual Honoring the Teacher event. University of Houston-Clear Lake's Environmental Institute of Houston, working in partnership with and through funding from the Galveston Bay Estuary Program, created wetlands at UH-Clear Lake to help control flooding and improve water quality before the water enters Horsepen Bayou. Researchers at the Environmental Institute of Houston at University of Houston-Clear Lake have found a better way to take to the water to accomplish their work by acquiring research vessels purchased with funding provided by a research grant. Becoming a better science teacher helped Clear Creek Independent School District's Hyde Elementary teacher Audrey Soto's class become better science students. The National Coastal Condition Assessment (NCCA) is one of a series of water assessments being conducted by states, tribes, the U.S. Environmental Protection Agency (EPA), and other partners. The Diamondback terrapin, Malaclemys terrapin, is a small to medium sized turtle found in salt marshes, estuaries, and tidal creeks. Environmental Institute of Houston historian Alecya Gallaway was awarded the Ruth Lester Lifetime Achievement award by the Texas Historical Commission. The legendary diamondback terrapin's survival depends on a little help from its friends. Brenda Weiser, associate professor of science education in the School of Education at the University of Houston - Clear Lake, has received the highest honor from the North American Association for Environmental Education (NAAEE). The Jeske Award recognizes outstanding service to NAAEE and leadership within the profession. The Texas Commission on Environmental Quality has awarded George Guillen, director of the Environmental Institute of Houston at the University of Houston-Clear Lake, a $54,554 grant. The Settlement Historic District in west Texas City is in the process of a National Register nomination. It is one of the oldest freedmen communities in Texas and is the only Reconstruction community in Galveston County. Twenty-eight area science teachers were honored and recognized at the annual Honoring the Teacher reception and dinner sponsored by the Texas Regional Collaboratives for Excellence in Science and Mathematics Teaching (TCR), the El Paso Corporation, and the Environmental Institute of Houston/University of Houston – Clear Lake. Lake Madeline's placid surface is perfect for water sports that require a ski boat and a towrope. George Guillen, UH-Clear Lake executive director of the Environmental Institute of Houston, received a $14,961 award from the city of Galveston for his proposal, which he titled, "Bacteriological Survey of Lake Madeline, Galveston, Texas." Students, staff & corporate partners around Univ. of Houston-Clear Lake will participate in the single largest organized environmental education event in U.S. history, April 14 & 15 from 8:30 - Noon, when they help plant our WaterSmart School Habitat Demonstration Lab, which is being constructed in front of the NOA (North Office Annex) building at UHCL. Project Learning Tree® (PLT), the environmental education program of the American Forest Foundation, has awarded 33 community grants for its GreenWorks! 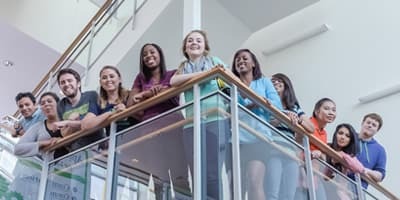 service learning projects across the country, including one to the Environmental Institute of Houston at the University of Houston-Clear Lake. TOHA President Shelly Kelly presented the first Mary Faye Barnes Community History Award to Alecya Gallaway on October 24, 2000, in the Moore Memorial Library in Texas City.